Quick, Easy and Light...What More Do You Want? 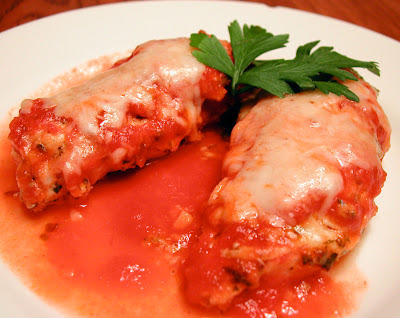 This is a lighter version of chicken parm. It is baked instead of fried and does not use breadcrumbs. I like it because it's quick, easy, contains less fat and has more of a "herby" flavor, which I love. Give it a try! Stir the oil, lemon juice and herbs in a small bowl to blend. Season with salt and pepper. Place the chicken and herb marinade in a large zip lock bag and refrigerate for at least 3o minutes. Heat a heavy large oven-proof skillet over high heat. Add the chicken, place in the oven and cook about 8 minutes, turning halfway. Remove the skillet from the oven. Spoon the marinara sauce over and around the chicken pieces. Sprinkle 2 teaspoons of mozzarella over each piece, then sprinkle 1 1/2 teaspoons of Parmesan over each. Sprinkle the butter pieces atop the chicken pieces. Bake until the cheese melts and the chicken is cooked through, about 4 minutes. I love chicken parm and eggplant parm. What a great idea for dinner tonight! It sounds yummy and yet light.